Observed along pathway through Kakamega Forest, Kenya, December 2014. 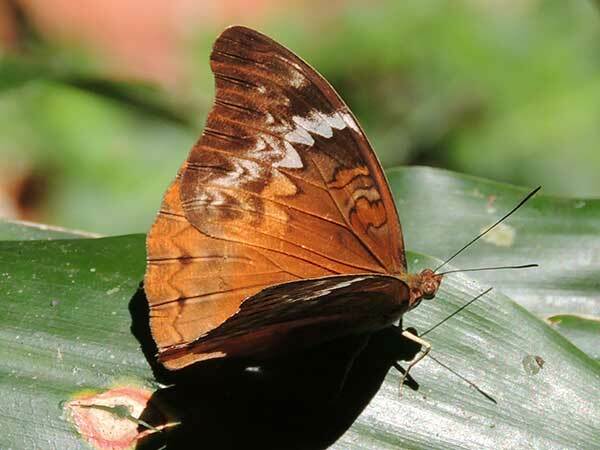 Butterflies belonging to the genus Cymothe are sexually dimorphic, i.e. males and females have sharply different wing patterns. In the case of the Lurid Glider, the male has a bright wash of golden scales covering the dorsal surface. 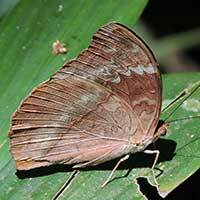 The specimen here is a female - she is rust brown and white on the dorsum while the underside is drab and very much patterned like a dry leaf. The bright color of males is likely related to courtship displays.